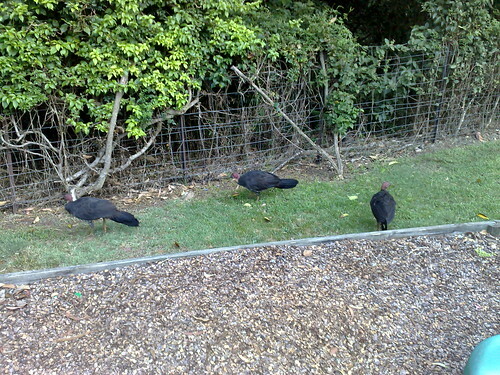 Remember our brush turkey neighbours and the enormous nest mound they built? It worked. 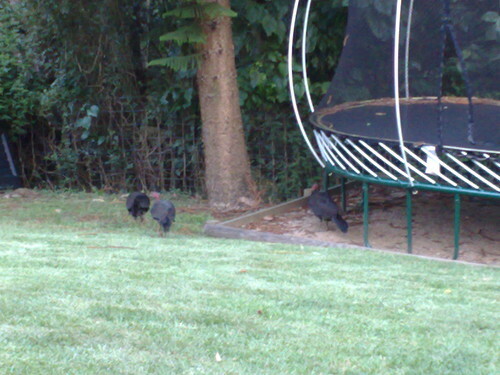 This evening there were three juvenile brush turkeys wandering around in our backyard. They look even less interesting without the bright red heads and brilliant yellow necks of the adults and they really didn’t want me getting too close but I managed to grab a few photos. I don’t recall the story, but I can appreciate the cycle of life! When’s dinner? PS: Sorry about the cat story Mim. I know it was icky, but a story is a story. Wow, I love brush turkeys! But I’m strictly vegetarian!